Department of Botany, University of Kerala, Kariyavattom Campus, Thiruvananthapuram, Kerala, 695581, India. Objective: The present investigation aimed to assess the nutritional, mineral profiling and anti-nutritional analysis of Gynochthodes umbellata (Syn. Morinda umbellata), an underutilized edible plant belongs to the family Rubiaceae. Literature perusal reveals that, there are no previous reports on nutritional studies for this valuable fruit. Methods: Nutritional, mineral profiling and anti-nutritional analysis of fruits were carried out. Results: In nutritional analysis, carbohydrates (6.98 g/100g fw), protein (2.68 g/100 g fw), crude fat (0.13 mg/g dw) and crude fibre (32.58%) content were detected. The fruits of G. umbellata, Vitamin C (25 mg/100g fw) was higher when compared to other three vitamin evaluated, Four macro elements and 6 micro elements were also quantified. 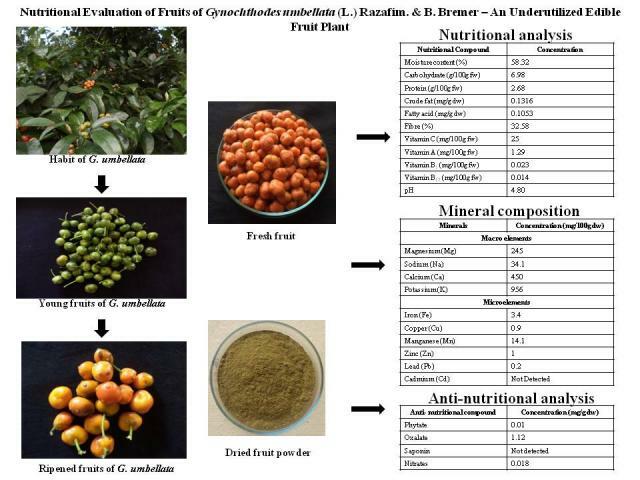 Conclusion: Nutritional and Anti-nutritional analysis reveals that, the G. umbellata fruits could be used as a source of protein, vitamin and minerals and highly recommended for consumption as they contain low amount of the anti–nutrients analysed. This is the first report on nutritional analysis of G. umbellata fruit. Keywords:Anti-nutritional analysis, Morinda umbellata, Nutritional analysis, Underutilized edible fruit. Sudhakaran A, Nair GA. Nutritional Evaluation of Fruits of Gynochthodes umbellata (L.) Razafim. & B. Bremer – An Underutilized Edible Fruit Plant. Pharmacognosy Journal. 2016;8(1):72-76.